Mitchell Docker and Leigh Howard have both extended their contracts with Orica-GreenEdge for another two years, the team has announced. Both Australian riders have been part of the Australian ProTeam since its inception in 2012, having come from the different backgrounds of Skil-Shimano and HTC-Highroad respectively, and will both remain with the squad through 2015. After a strong Classics season in his final year with Skil-Shimano - where he took sixth in Gent-Wevelgem and 15th in Paris-Roubaix - Docker’s time with Orica-GreenEdge began badly as a bad crash in the team’s January 2012 training camp saw him sidelined for four months. “I was really happy with the support the team gave me when I was coming back from my injuries,” said Docker. “There was never any pressure to return quickly. I think I was able to repay them this year with some good riding in the support roles that I had. 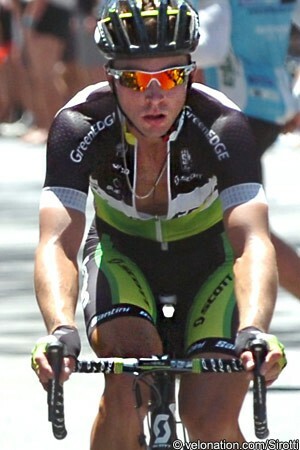 Sprinter Howard took one victory in 2012, his first season with the team, but began 2013 by winning two of the races of the Challenge Mallorca: the Trofeo Migjorn and Trofeo Platja de Muro. While he wasn’t able to raise his arms again during the season, he feels that he is making steady progress with the Australian squad.